Regina Chacha ’85, carrying on the international ministry she and her husband started, earns recognition alongside icons of American arts and politics in Vanity Fair magazine. VANITY FAIR – a glossy magazine touting coverage of celebrities, culture and politics – might be one of the last places you’d expect to find Regina Horst Chacha ’85. 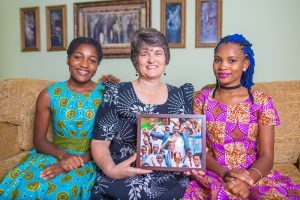 Thanks to a providential connection, though – in Tanzania, at that – Vanity Fair is just where this Eastern Mennonite University graduate and daughter of a Virginia Mennonite pastor has landed. Regina, who in Tanzania is known as “Mama Regina,” was nominated to the magazine’s Hall of Fame for her ongoing work with City of Hope, a ministry of two schools, an orphanage and a clinic that she and her now-deceased husband John Chacha ’84 founded in Ntagacha, Tanzania. The other 2016 Hall of Fame inductees were Hamilton creator and star Lin-Manuel Miranda; Olympic gymnast Simone Biles; author Megyn Kelly, who hosted at Fox News at the time of the award; Lonnie G. Bunch III, founding director of the Smithsonian’s National Museum of African American History and Culture; and then President Barack Obama and First Lady Michelle Obama. 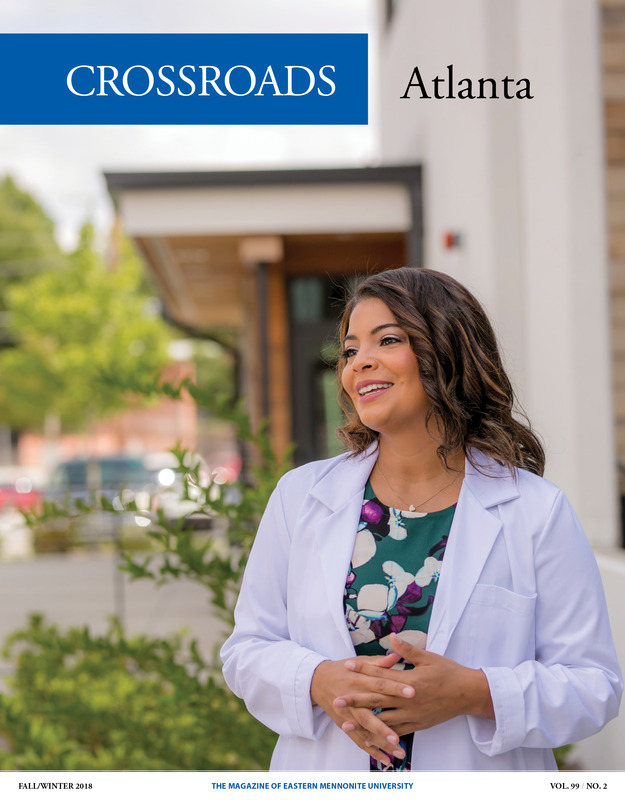 The August 2017 issue of the magazine featured a photo and article describing Regina’s story as one that defies the odds. If anyone is surprised, it’s her – and not just by the Vanity Fair recognition. Born in Canada, Regina was one of four daughters who grew up near Winchester, Virginia, after the family moved to take on a pastorate at Stephens City Mennonite Church. 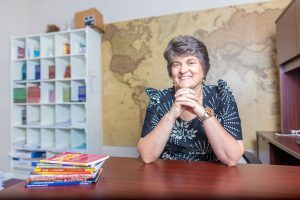 But it wasn’t until she was a student at Eastern Mennonite College that she became interested in doing her own missions work. At EMC she made friends with inter-national students, had a roommate from Ethiopia, soaked up the university’s emphasis on service, and became a founding member of Student Missions Fellowship. “I made that commitment,” Regina recalled recently. It was a “no restrictions, no holds barred” statement that she counts as a “crucial decision” in her story. During the following year at EMC, she became better acquainted with another Fellowship founding member, John Chacha, then known as John Chacha Nick. “Where before I was more of a home-type person – I didn’t really want to travel much, and things like that – John got me more and more excited about missions,” she said. After John graduated from EMC in 1984, he returned to his home countries of Tanzania and Kenya and continued to be active in missions. Regina went on to graduate in 1985, and that fall they became engaged over the telephone. Because he was not granted a visa to the United States, her father married the couple in Canada in the church he had previously pastored. A few months later in 1986, they were able to return to Virginia and settled in Martinsville, where they had friends who were starting a church. During that time John continued writ-ing what would eventually be more than 20 books and developed a curriculum for church-based Bible schools. Regina taught for nine years in the public school system. They also traveled to help bridge gaps between segregated Christian groups. Regina remembers visiting an all-white church in South Africa where John was the first black person ever to speak. Regina Chacha with daughters Sarah (left) and Rose in their Martinsville home. “You could feel the tension when he got started, but he just had a way of breaking down barriers and within a little bit after he started speaking, people were pulling out their notebooks and taking notes, and it really was effective,” she said. Eventually, in 2007, one of John’s sisters suggested that he return to his home village in Tanzania. City of Hope began with a children’s home and a medical center located right at a battleground where different clans fought, in part over cattle theft. They called it Amani (translated as peace) Medical Center. City of Hope has gained recognition over the years: In 2009, the Tanzanian president visited, and this year it received the Mwenge wa Uhuru (Freedom Torch) for the third time. This awarded honored its work in agriculture and water collection, and, most recently, the secondary school chemistry and biology lab facilities. In addition to the clinic, which has served thousands, the organization now includes a children’s home for more than 100 orphans; Destiny Primary School with 450 students; and the Dr. John Chacha Secondary School and Institute of Leadership, which opened in January with 45 students. As the City of Hope expanded, it became a project for the whole family. One daughter works in a sewing and design program for students there, and their other five children are also involved. Tragically, in the spring of 2015, a truck accident killed John and a student, leaving Regina at the helm. “I’m really thankful for how, because of the things we were doing together, he prepared me for leading now that he’s gone,” she said. Now the ministry’s international executive director, Regina has continued the work, this year making five trips to City of Hope. She is also the guardian for 33 children from City of Hope who study at the Mountain Mission School in Grundy, Virginia. From early on, the Chachas envisioned City of Hope as a place where people from the U.S. could come to serve in and learn about another culture. In 2011, one of those guests happened to be Stacey Sauerberg, whose husband, Bob Sauerberg, is the president and CEO of Condé Nast, which owns Vanity Fair. Now, in honor of his wife, who died in late 2016, Sauerberg has established The Stacey Sauerberg Women’s Leadership Initiative under the umbrella of City of Hope, with the goal of empowering women. In part, Vanity Fair’s recognition of Regina’s ongoing work comes “because the challenges remain immense,” it proclaims: Regina said that City of Hope still needs a school bus, teacher housing (a government requirement), a better solution for water, and more land for growing food – and those are just needs relating to the new secondary school. But Regina persists with the ministry’s “huge vision” because it will have a “big impact and influence people for the Kingdom,” she said. Eventually she wants to add a nursing school as well as other vocational training programs. And so actually, in a way, none of it – not her story, not her work with her hus-band John, and not her recent acclaim in Vanity Fair – is at all surprising.